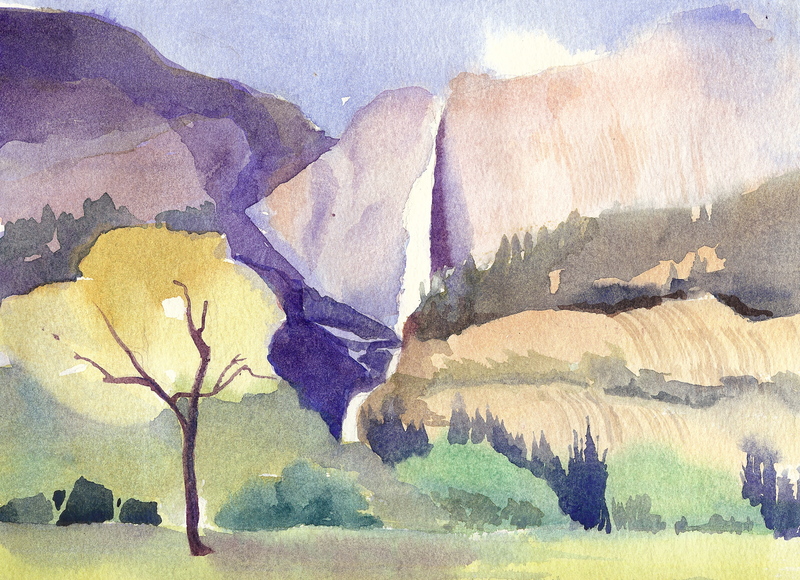 I did this painting in ’94, plein air, in Yosemite National Park. When I started painting, I was encouraged to ‘get out there and take workshops.’ Find out what other artists are doing. Investigate who I am as an artist. Build an arsenal of tools and techniques. I hadn’t been painting long enough to have developed my own voice (style) but I certainly wanted to and I wanted it ‘right now!’ When I look back through my paintings over the years the one thing that definitely grabs me is color. I find that using a very limited palette (yellow, red (rose), blue) and mixing my own secondary colors and neutrals gives me the power to control the overall mood of a painting. And as you know, in watercolor you are mostly out of control, so being in control of at least one thing feels pretty good! This entry was posted in SomeThoughts, Watercolor and tagged art, camping, colorful, fall, granite, illustration, mountains, nature, painting, pines, rocks, shadows, textured, trees, valley, watercolor, waterfall, western, Yosemite, yosemite national park. Bookmark the permalink.